Gardens of the Villa Taranto : and other music of Colin Brumby. 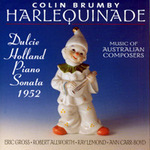 Harlequinade : six pieces for piano / by Colin Brumby. Harlequinade : music of Australian composers.